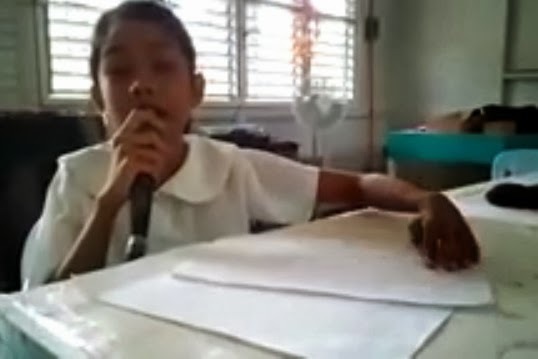 Manila - A talented and young Filipino blind girl from Southern Philippines is now the much talk-about and subject of interest of netizens after a video of her singing Miley Cyrus 'Wrecking Ball' was uploaded on Youtube and became viral on social media since Wednesday, October 23. The young girl singing the Miley Cyrus hit on the video is holding a microphone in one hand and appears to be reading braille with the other while performing. The popular video will leave you with goose bumps as the young girl shows off her pipes. The video was uploaded by George Doton and says that Joyce, 11 year-old (Grade 5 student) is from Barangay Luzon, Governor Generoso, Davao Oriental. As of this writing, the video hits around 325,000 views. One of the comment on Youtube said: "wow....this girl is so talented...being blind is hard...that's why she has more emotions on singing...like a girl﻿ singing..while closing her eyes." Vladimer Verdan on Youtube said: "When I saw this video of a little girl I didn't control my emotions to cry oh my god I can feel the sensations in every word she sing the lines of the song,, please help and don't discriminate those people who born like her, instead give them special attention I'm sorry but this is what I felt please don't deny the﻿ fact that there were someone there who criticize of being in different among us.."
Similar uploads of the video on social networking site Facebook garnered thousands of likes and shares. One of the copies uploaded on Facebook goes viral. The post now have more than 242,000 likes and shared more than 108,000 times. Aside from the local blogs and websites in the Philippines, international websites like mirror.co.uk, ibtimes.com and latinopost.com also create a featured post for the blind Filipino girl. Youtube nowadays become an avenue for the Filipino talents to gain popularity through viral videos. Among the list of now so called Youtube sensations are Aldrich Talonding and James Bucong, for their "Dance With My Father" rendition; Zendee Tenerefe, for the "random girl" clip that shows her singing at a mall; Cheridel Alejandrino, the elevator girl and the worldwide popular singing senasation Charice Pempengco.